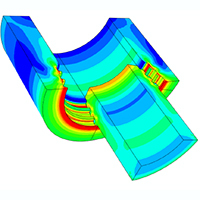 Learn how to test and simulate a simple bracket in Abaqus. Build a framework model using a 3D wireframe read in from a CAD system. Test some of the skills learnt during tutorials 1, 2 and 3. Learn about simple plastic deformation with unloading. Use Abaqus Explicit to model Crash and Impact. Use Abaqus Explicit for a Snap-Fit behaviour contact challenge. Learn how to simulate the impact of a ball being fired at an aluminium plate. Learn how to modify a structural model of an aircraft wing to define the material properties and the stacking sequence of the laminated structures. Learn how to modify a structural model of a wing panel to define the material properties including the ply failure parameters. Learn how to modify a structural model of a stiffened panel to define the material properties including the ply failure parameters. Learn how to model the failure of a bond with the Virtual Crack Closure Technique (VCCT). Learn how to model the failure of a bond with a cohesive approach. This tutorial guides you through importing implicit into explicit and covers an example with a pre-tensioned bolt imported to a impact drop. Learn how to modify a structural model of a stiffened panel to define the material properties including the ply failure parameters and create X-FEM domains. Learn how to modify a model of a compact tension (CT) test to define thematerial properties, including a pre–existing crack and create X-FEM domains. Learn how to setup a Coupled Eulerian-Lagrangian (CEL) model of the moulding process of a polymeric bottle. Learn how to create a pure heat transfer model of a hot teapot. Learn how to create a coupled thermal-stress simulation of a bimetallic thermostat in which temperature field and displacement are solved together. Learn how to create a transient fluid dynamic analysis of a bifurcated artery with Abaqus/CFD. Learn how to investigate the time-dependent viscoelastic behaviour of a rubber seal after compression. Learn how to perform a linear dynamic analysis to extract the natural frequencies of a steel bridge. Learn how to use SPH modelling in Abaqus CAE. Learn how to use a bolt load and assesment of a connection by means of pressure penetration interaction. Learn how to create a model of a bending beam and subsequently create a macro and a python script to change the mesh size in the model and rerun it. In this tutorial, you will be shown examples which demonstrates high quality contact simulation. In this tutorial it will show you the capability of Abaqus to solve for contact where an instance gets in contact with itself. This exercise will show you how to include friction as interaction property and how to investigate its effects for a disk brake system. In this tutorial, you will learn how to treat overclosures with a contact pair approach. This exercise is intended to show two useful Abaqus capabilities related to contact handling: geometric surface smoothing and contact stabilization. This tutorial shows an example of how to deal with such dynamic instabilities by either introducing viscous stabilization or by solving the problem with a dynamic procedure. This exercise involves the use of beam elements to model a tower falling. Contact with two objects on the floor will deform the tower. Get notified on the next tutorial!